Elegant and graceful in design, fresh topiary plants are easy to care for. 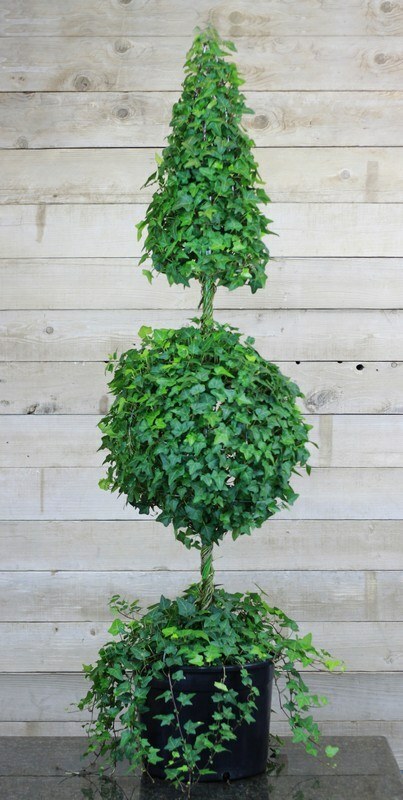 Sold in a 31.5 pound size, this ivy topiary tree can be used to decorate the home or exterior landscaping. Since it is sold in a pot, it is immensely portable and can be placed outside during the summertime. During the winter, the live topiary trees can return to the interior of the home for an extra touch of greenery to last through the cold days of winter. The main requirements for a topiary plant are like any other plant. All it requires is water, indirect sunlight and a peaceful spot to grow. This type of plant will generally do best in a temperature range of 40° to 80° F. Due to this, it can be placed outdoors during the summer. If the temperature falls below 40° F at night, the ivy topiary must be brought back inside. Watering the plant should generally occur when the soil has started to dry out. As a rule, it should be fertilized every four to six weeks. After adding a half of a cap to a gallon jug of water, the jug can be used to water the plant. For an additional boost, the plant can be misted with water a couple of times each week. One of the most phenomenal features of a fresh topiary plant is their ability to grow into nearly any shape. With a bit of time and patience, gardeners can shape their topiary into cartoon characters, spirals, circles or words. This can be done with some plant ties, wires frames and pruning shears. Whenever a vine is dying or broken, it can be trimmed with the pruning shears. Stray vines that leave the design can be looped back into the main plant or tied with a plant tie. For best results, the plant ties should be attached loosely so that they do not damage the vines in any way. In addition to improving the shape of the plant, vines can also be incorporated into it as a way to thicken up any thin areas. With the proper care and attention, a live topiary trees can grow for years. Designed to be easy to care for, these plants grow vigorously with basic gardening techniques. For a spot of winter greenery or a unique design fixture, homeowners cannot go wrong with a topiary plant. Offered in numerous designs and species, there is a broad array of options available for individuals to choose from.